Hits for the past month, analysed. Lookie here. Yes, I know I mistyped “checked” as “cheked”. Too late to edit it now, though. But yeah, the text underneath the graph should explain my thoughts on certain parts of it. You should do so too, it’s fun to look at your blog’s stats and think about what and how and everything. For example, my blog got boomed with hits after my first post about the 3DS. Conclusion: talking about news that attracts lots of people gets you more hits! WHAAAAAAAAAT. How the hell do you get to my blog when searching that? I don’t recall ever typing that letter-combo, either. Oh and today’s physics test went rather okay. And I had answers to the pics..
Haha asdfghgh! Perhaps that will affect the search engines even more now that it is in the comments section. Thanks for the info, makes things clearer on what happend! i like to look at the stats too, tehy are very interesting at times. try to figure out why i get certain peaks and falls. Hi Fang, I’ve got in contact with some developers and they’ve given me a couple of codes for a mac game called Lume! The review will be going live either this Friday or Next Monday + the giveaway competition! Stay tuned! You actually seem to have some pretty consistent up and downs. Diglett! lol that’s all I know though. ASDFghgh is a toolbar download that some people most have been trying to get to and seen your blog underneath it’s #1 google PR for that keyword. Just some random luck. Enjoy the hits from it. LOL at the search term. congratz on the physics test. 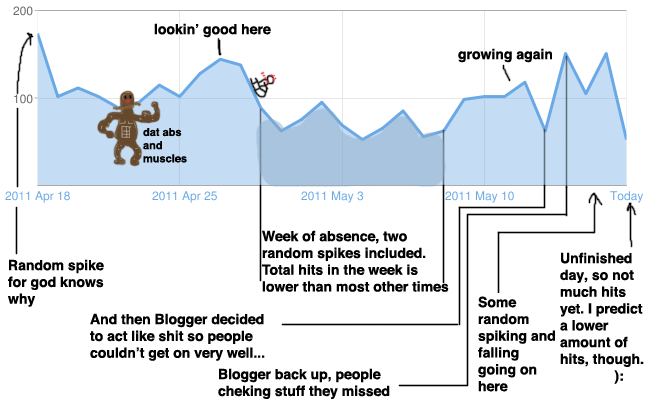 i’ve often contemplated posting pictures of my ripped physique in order to manipulate my blog’s statistics. i typed in asdfghgh in google images. a good portion of the second and third pages are devoted to the pictures of people who comment on your blog. weird. haha. also, i’m gonna guess. diglet and a guy on a snowmobile/sled! do i win? do i win? Your graph looks so happy compared with mine! I can only recognize a digglet, the guy in the slider is something new to me. I love the “adsfghgh” … ! And 4 times!? You drew a tanned MACHO MAN. That’s funny. The random spikes get me too. Not sure what you drew, I think I have an idea of what you drew, but won’t embarrass myself by trying to describe them since I don’t know what they are called exactly. totally diglet and line rider!